In the summer of 1998 (or ‘99?) while walking around a flea market in Tübingen, Germany, I found a box of matchboxes at a stand with toys. They were named and labelled, contained small objects, came in a certain edition and contained a humorous and almost metaphysical idea. The perfect multiples in a Fluxus spirit were offered between old toys and other jumble. I started to ask the man behind the stand about these multiples, but he was just standing in for his children, who had made the boxes. He seemed almost embarrassed when I enquired about the price. I bought seven of the multiples for 1 D-Mark (about 50 Cent) each from him. I waited for a while, but the kids didn't show up. So I didn't have the chance to meet the original artists. This re-make of the original multiples is dedicated to the anonymous artists who brought them to life. This text is from the booklet included in Böhm's multiples from 2004. 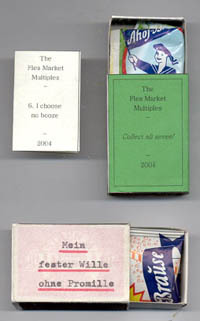 The edition of this remake is 50 copies consisting of seven different multiples. All copies were send to Australia and there sold to different collectors by David Dellafiora. 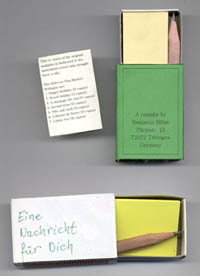 Also there is an extra edition which Böhm made especially for the Museum of Temporary Art and donated it in May 2004. That's why not only Böhm's remakes are preserved but also th original multiples. In addition to that we can present original comments to each multiple by Böhm taken out of the documents in the archive of the museum. Two matchboxes. 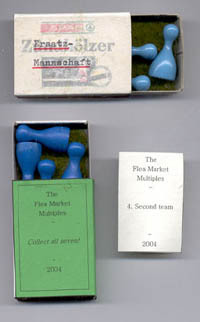 The first has 'happy birthday' and some hearts and flowers on its label, the second is labelled 'The Flea Market Multiples - Collect all seven - 2004'. 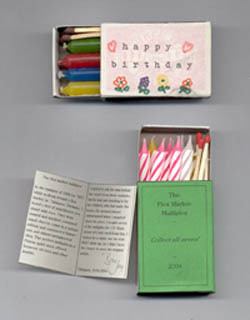 Both contain a number of small candles and some matches. Two matchboxes. 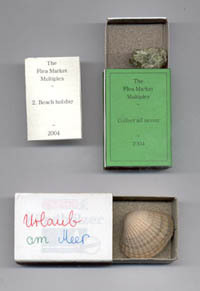 The original has 'Urlaub am Meer' on the label, the second is labelled 'The flea market multiples - Collect all seven - 2004'. Both contain a piece of sand paper, one a shell, the other a piece of Olivin, collected on the Canaries. Debby asked for the original multiples and a set of re-makes for the Museum. There's also 'Visit The Museum of Temporary Art' on the re-make. Two matchboxes. 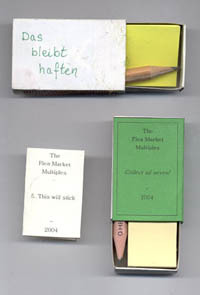 the original has 'Eine Nachricht für Dich' written in green pencil, the matchbox itself is Swedish. Both boxes contain blocks of Post-Its and small pencils. The messages are to be written. Two matchboxes. the original has 'Ersatz-Mannschaft' written with typewriter on its label. Both boxes contain 4 wooden game-pieces and a piece of artifical lawn. Two matchboxes. Both contain Post-Its and a small pencil. the original is a Swedish matchbox. Two matchboxes. the original was labelled 'Mein fester Wille ohne Promille' - My best intention without alcohol level. Both contain a package of 'Ahoi brause', a famous German lemonade powder. Two matchboxes. 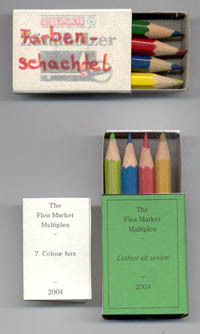 the original is labelled "Farbenschachtel", both contain one blue, one red, one yellow amd one green pencil. I liked the extra basic colour green. I wonder how many of these boxes will be sold in Australia during the 2004 Next Wave Festival.